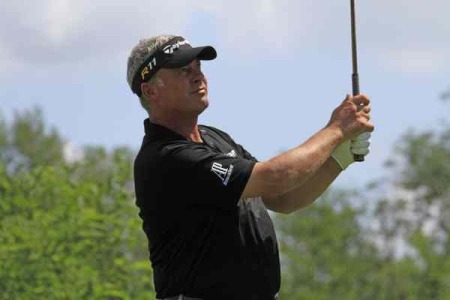 Darren Clarke in action earlier this year. 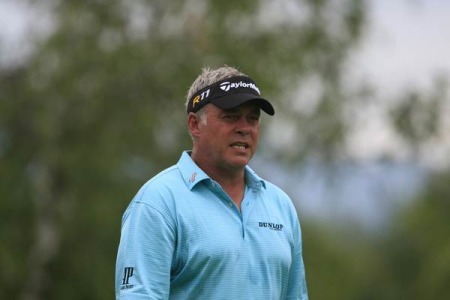 Picture Stuart Adams /www.golffile.ie Darren Clarke slipped back into the pack afer a disappointing second round at the Australian PGA Championship in Queensland. Fraser shot a flawless seven-under 65 to lead by two shots from American Bubba Watson, who hit a 68 on Queensland’s Sunshine Coast, north of Brisbane. “I felt like I played great over the last couple of days and finally got the putter working the way it should be and it’s nice to see the ball drop, so hopefully that continues over the weekend,” Fraser said. Clarke opened with a bogey at the first and finished with a bogey at the 18th. In between, he produced a mixed bag by combining birdies at the third, fifth, 10th, 16th and 17th with double bogeys at the ninth and seventh. He was also easily outscored by his playing partners Adam Scott and Greg Norman who shot rounds of 67 and 69 respectively. Scott is tied for fourth place, four off the pace on seven-under while 56-year old Norman is tied 28th, a shot better than Clarke, on three-under. Darren Clarke is just three strokes off the lead after the first round of the Australian PGA Championship. Photo www.golffile.ieDarren Clarke confessed that he was impressed by an incredible comeback by playing partner Adam Scott in the opening round of the Australian PGA Championship in Queensland. Darren Clarke was philosophical about his third round 79 in Australia. 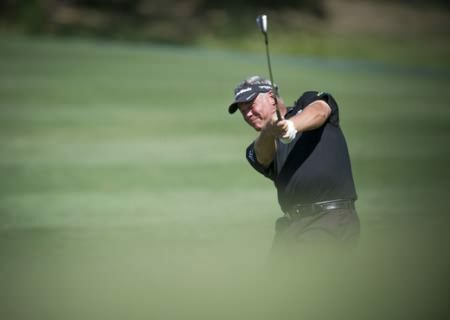 Picture Eoin Clarke/www.golffile.ieDarren Clarke crashed to a third round 79 as South Korea’s KT Kim took a one stroke lead over American Bubba Watson in the Australian PGA Championship. Darren Clarke hasn’t had a top 30 finish since winning the Open. Photo Eoin Clarke www.golffile.ieDarren Clarke will be hoping for better in next week’s Nedbank Challenge in South Africa after finishing 54th in the Australian PGA Championship on the Hyatt Regency resort course in Coolum. Darren Clarke nails his approach into the 9th green at Coolum during the first round of the Australian PGA Championship (Photo: Anthony Powter) www.golffile.ieDarren Clarke is on course to finish his worst ever season with his best finish for 18 months. Darren Clarke lines up his putt on the 18th at Coolum during the second round of the Australian PGA Championship (Photo: Anthony Powter)When Darren Clarke won the 2011 Open Championship he never imagined it would take him another 17 months to record his next top 10 finish.